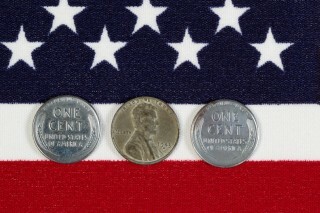 Minted from 1909 through 1958, Lincoln wheat pennies were among the longest-running United States coin series in history. The Lincoln cent was designed by famous Lithuanian-born sculptor and engraver Victor David Brenner and initially honored the 100th anniversary of President Lincoln's birth; the wheat stalk design on the reverse of the coin symbolizes our nation's prosperity. The Lincoln cent arrived with great fanfare on August 2, 1909, replacing the Indian Head pennies that had been circulating for up to half a century. Admiration for the new Lincoln cent was great, with banks across the country running out of the newly minted 1909 Lincoln pennies in mere minutes – providing an opportunity for many an enterprising young person to sell his or her new Lincoln cents for two cents or more each(!) However, the public started decrying the coin as many individuals felt Brenner's initials (VDB), which were located on the reverse of the Lincoln penny centered under the wheat stalks, were too prominent. The United States Mint was swift in responding to complaints concerning the placement of Brenner's initials and removed the offending letters within a few weeks of striking the first Lincoln cent. This move created one of the most popular rarities of all time: the 1909-S VDB Lincoln cent. Wheat pennies would remain without the VDB initials until 1918, when they were restored on the coin in a much smaller format under Lincoln's shoulder. By that time, hundreds of millions of Lincoln cents had already been produced, with the bulk coming from the Philadelphia mint. Far fewer were produced at the Denver and San Francisco mints during the teens, which lends to the reason why most semi-key Lincoln cents are branch mint issues from the 1910s (the 1914-D Lincoln cent is one of the rarest regular-issue Lincoln cents). The 1920s and 1930s saw several scarce wheat pennies minted, including the 1922-D, 1924-D, and 1931-S. However, the rarest issue from either of those two decades is the 1922 no-D Lincoln cent, a variety that was produced when damaged dies bearing the "D" mintmark were polished to the point of obliterating the mintmark. Interestingly, 1922 was the only year that wheat pennies were struck exclusively at a mint other than Philadelphia. Wheat penny production skyrocketed in the 1940s (in fact, the Philadelphia mint alone struck more than 1 billion pennies for the first time in 1944), but for Lincoln wheat cents, the decade would be headlined by the one-year issue of steel cents in 1943. Steel pennies were minted to help save copper for a more important matter – manufacturing cartridge casings for our efforts in World War II. 1943 steel pennies are quite common (more than 1 billion were struck in total by the Philadelphia, Denver, and San Francisco mints), but they are unique in appearance and have long been somewhat of a novelty item enjoyed by both seasoned and occasional coin collectors alike. Aside from their silvery-white appearance, 1943 steel wheat pennies are distinguished by their weight – a relatively light 2.7 grams as compared to the 3.11 grams that a typical bronze Lincoln cent weighs. A few bronze 1943 cents were made in error, and the following year some 1944 steel cents were produced by a fluke most likely caused by planchets of the wrong metal being left behind in the mint's coin hoppers. Production of Lincoln wheat pennies continued into the 1950s, with billions of one-cent coins being produced each year during the latter part of the decade. Most Lincoln cents from the '50s are highly common and worth little more than face value, but be sure to take an extra close look at any 1955 pennies you have. Between 20,000 and 25,000 1955 cents feature doubling of the date and lettering on the obverse; 1955 doubled die Lincoln cents are worth a pretty penny indeed – upwards of $1,000! In 1958, with the 150th anniversary of Lincoln's birth approaching, President Dwight Eisenhower and Secretary of the Treasury Robert B. Anderson approved a new Lincoln cent reverse design by Frank Gasparro featuring the Lincoln Memorial. Permanently replacing Lincoln wheat pennies, the first Lincoln Memorial cents were struck on January 2, 1959. I have a 1969s penny where u can see it's been stamped twice,one stamp is verticals n the other horizontally where u can clearly see the coat, shoulder n chest lines right in front of Lincoln's face and the "liberty" right on the coat collar of his chest. Based on the description, this coin may be a multiple struck off-center coin, clashed die error, or another type of coin. Would you mind posting a photo of this coin in the Forum so we may get a better idea as to what you have and possibly provide a conclusive answer?